Plush STEVE JOBS! buy 500 and A MIRACLE WILL HAPPEN!! SACRED IDOLS AVAILABLE GOOD LUCK FOR YOUR HOME AND OFFICE! 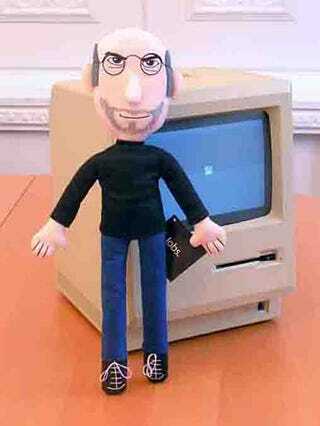 plush STEVE JOBS!!! BRING GOOD LUCK TO YOUR BUSINESS! CUDDLE STEVE JOBS FOR FRIENDSHIP, WARMTH AND GOOD KARMA. FIRST RUN OF 500 NOW AVAILABLE FOR YOUR DISCERNING CONSUMPTION. BUY ALL AND STEVE WILL FEEL BETTER MIRACLE!! GIVES YOU IPHONE IN GRATITUDE. SEND THIS MESSAGE TO 15 PEOPLE OR YOUR MACBOOK WILL BE CURSED.